Mackerel Cutlets with Tomato, Olive and Caper Salsa | Gourmet from the galley! This meal was made with a fresh catch while we were anchored at Hope Island, on the Great Barrier Reef. It was a few days out of Cairns and we still had some fresh vegetables from our shopping trip that we needed to use. The green beans were on their last days so, as it often happens on a boat, what we decided to cook for dinner was determined by the veg we had and what needed to be eaten first. Dwayne caught, cleaned and cut the spanish mackerel into cutlets. He then barbequed the cutlets while I made a salsa. For the salsa I diced tomato, kalamata olives, red onion, anchovy, chilli, capers and added a little olive oil. The beans, which were begging to be cooked, were blanched in boiling water for a minute or two and set aside. I sautéed a little garlic in butter and tossed the beans and some chopped pistachio nuts through it. 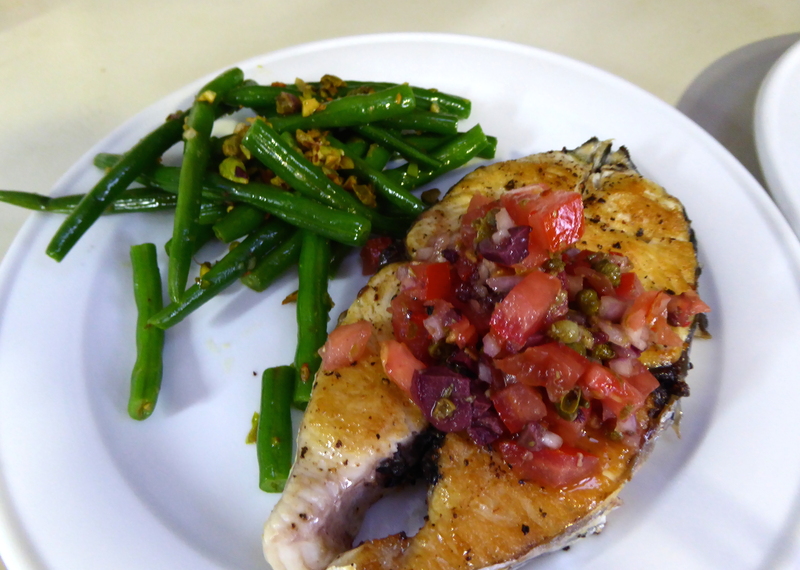 We enjoyed a delicious meal of BBQ mackerel topped with the salsa and served with the beans on the side. We love mackerel… don’t think we’ll ever get sick of it! Previous PostCrayfish Salad with Thai-Style DressingNext PostBBQ Marlin Fillets with Grapefruit, Fennel, Lime and Dill Salad.